Here are a few photos of more visitors at PineSong. Every fall, we get ready for the annual white tailed deer season. 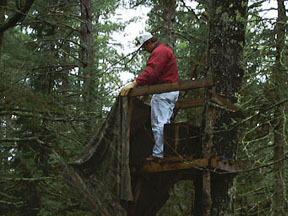 This photo shows Craig Carlson stapling camoflage cloth to his deer stand. Craig and Kathy have been good friends of our for over 20 years, and for the past 15 years or so, Chuck and Craig have hunted together. Craig's son Eric is now a full-fledged member of the hunting trio. Craig has a neat web site that you will enjoy visiting. Pictures and a QuickTime VR of Akumal, two grandsons, Eric and Missy's wedding and lots more. Kathy, Craig's wife, is even more adept at dodging cameras than I am. 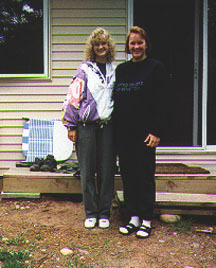 I found only one photo of her at PineSong. 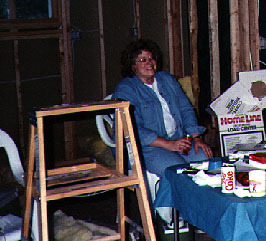 Instead of posing among the trees, here she is overseeing construction of the cabin. Besides smiling a lot, Kathy makes really mean meatballs that make you enjoy falling off your diet. This photo was taken a few miles from PineSong on the Namakagon River. In the blue vest is Bob, the guy I shared an apartment with while we studied at the University of Wisconsin. Jerri is in the bow, and Chuck is crosswise of the current. We canoed down the river to a takeout near PineSong. It was a great day with rain and everything. Bob and his wife Jodi are the authors of the definitive book on canoeing in Wisconsin, Whitewater, Quietwater. Kati and Assi are two more wonderful people whom we got to know when they were Rotary Exchange students in our area. They came back from Finland to visit the families with whom they had lived with during their stay as students, and we talked them into spending a few days with us. Both are now working at their university studies.